The free book of the hour (or week in this case) is the beautiful and inspiring Flowers for Sarajevo by the multi-talented author John McCutcheon and illustrator Kristy Caldwell. 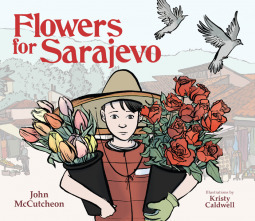 Based on real events of the Bosnian War, Flowers for Sarajevo tells the uplifting story of young Drasko who is inspired by the cellist of Sarajevo to take action in his own way against the violence in his hometown. Beauty overcomes suffering in this powerful picture book. Enter for your chance to win a copy in our GoodReads Giveaway! The giveaway will last one week, so make sure you enter soon! Giveaway ends April 08, 2017.